Aunty FeeFee: Faith Turned Funny? It starts with the line, “Good afternoon Facebook I was sitting here pondering the new year and I was thinking its New Year’s all over this land and God we thank ya because you have blessed our land… these are the words that came to me, May I share them with you now Facebook? 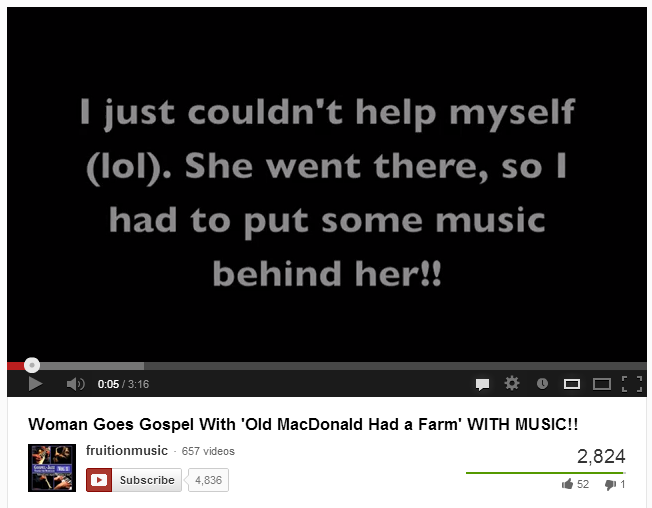 Thank you” She then proceeds to sing a rendition of This Land is Your Land peppered with “Hallelujahs!” and remixed with a rendition of Old McDonald Had a Farm complete with e-i-o’s and oinking. She even goes so far as to thank God for chitterlings and Louisiana Hot Sauce and with a voice full of emotion and genuine praise for what she terms a “mindful God” Aunty FeeFee shows her gratitude in the New Year. When I initially saw the video I wasn’t sure if Aunty FeeFee was being comical, facetious or if this was, for her, an authentic expression of a religious experience. Upon further investigation I discovered multiple videos, Christmas wishes, a dedication to President Obama, and just some good old general encouragement. Aunty FeeFee has 2,654 subscribers on YouTube, 931 followers on Twitter (where the name AuntyFeeFee is trademarked) and a stunning 10, 589 subscribers on Facebook and 5,000 friends. What is fascinating about Aunty FeeFee is not her ability to find faith in such small and mundane facets of everyday life, rather it is the way she chooses to express these notions. In the third space facilitated by the internet and social media, her videos and expressions have taken on a life of their own and been mediated and re-mediated in interesting ways. 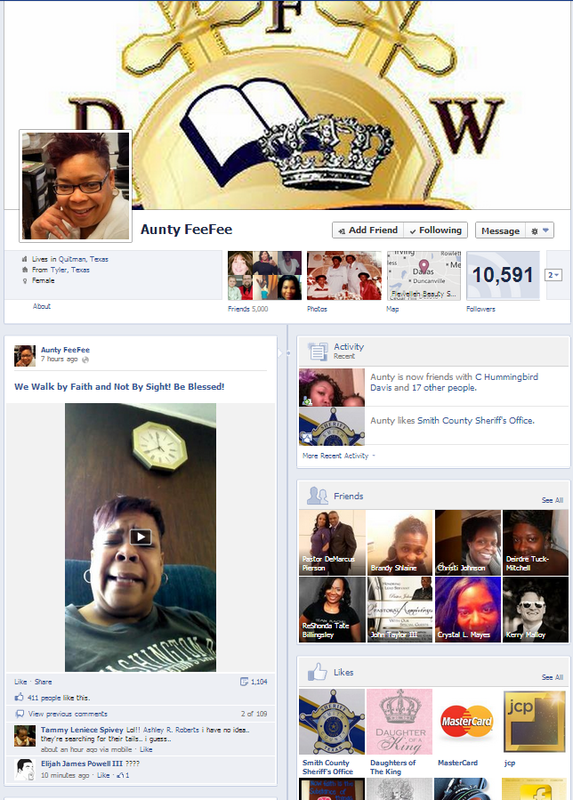 It appears from her Facebook page that Aunty FeeFee’s faith and spirituality is firmly grounded in the physical realm where she attends a Baptist Church in Texas. Based on this information, coupled with her online presence, it could be argued that social media are an extension of this very real, grounded faith and a space through which to extend the reach of a faith she portrays passionately and fully in her songs and videos. Even more fascinating than Aunty FeeFee’s intent are the reactions and re-mediations from social media audiences. After all intent has little bearing on interpretation and outcome. What does it mean to have a genuine expression of faith being shared on Facebook as comedy, lauded as funny enough to change the course of your day, not in the way it invokes passion and faith but in its ridicule. Does this diminish the power or possibility in Aunty FeeFee’s authentic expression? Do messages become less authentic as they are re-mediated and their messages shifted? The re-mediations range from re-mixes of the videos set to new melodies and narrations of the videos where audience members turned creators point out their favorite moments giving Aunty FeeFee’s words a whole new meaning and giving them the potential to reach a broad and ever expanding audience. 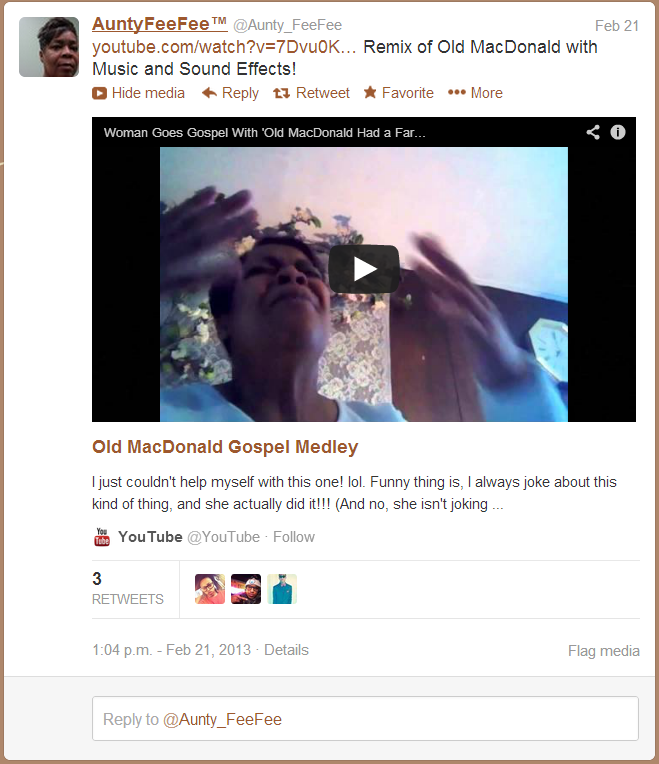 To add to the new life of these videos, Aunty FeeFee herself has been known to retweet some of her favorite re-mediations of her original videos. Thus, we must interrogate, does re-mediation add power to a message? Does the creation of a new meaning, though often disparate from the intended meaning diminish the value of the message? Are the new mediations, even in their lighthearted mockery of the initial message, still carry forth the power and promise that Aunty FeeFee intended? And most importantly, could these messages, problematic as they may be in their extended life, exist if not for the space facilitated by social media? I argue they could not. I argue that Aunty FeeFee, perhaps a social media celebrity of sorts, would not be able to spread her message beyond her community if not for the potential to “share” on Facebook and download from YouTube. She would not have an extended reach if not for the ease with which technology has allowed us to take messages, shift them and change them into our own. There is a power implicit in the ownership that coincides with re-mediation. 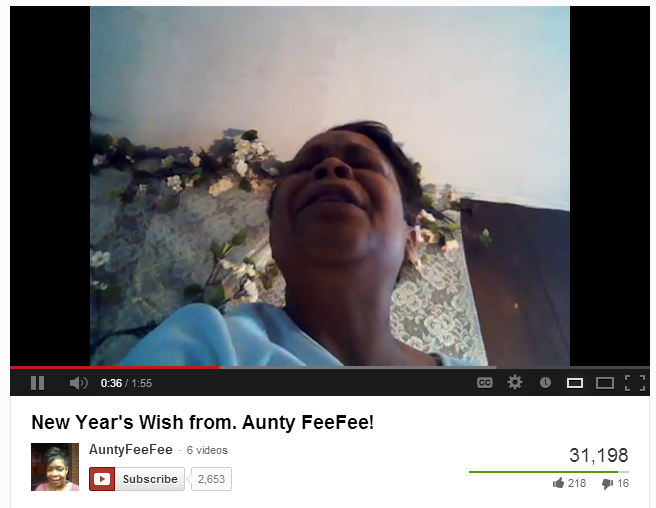 Aunty FeeFee’s message is explicitly religious. God is mindful, in God we find what we can be thankful for and in her own words, “promise is coming.” In the re-mediations and changed videos, the meanings are still there but they are not the focus. Despite the shift in focus, the original messages remain present. This is one of many affordances of this medium. Though messages and intent have been changed, shifted and given new meaning, the original foundational message still exists within each re-mediation. The question remains, in their new form, in this new space, what exactly do they mean to you?